Buggy RPP session that makes Reaper slow and crashes when closing. Could anyone identify the problem? Now that's a weird project file for sure (you can open .rpp files with a text editor btw., they're 'human readable', kind of an XML format.). It contains identical 'MARKER' lines several thousand times. That's (mainly?) why it's so big. Any idea how that could've happened, using a script that deals with markers / regions by chance? I've deleted (only) all MARKER lines in the project file which reduces size to ~ 1MB. Last edited by nofish; 03-18-2019 at 11:02 AM. 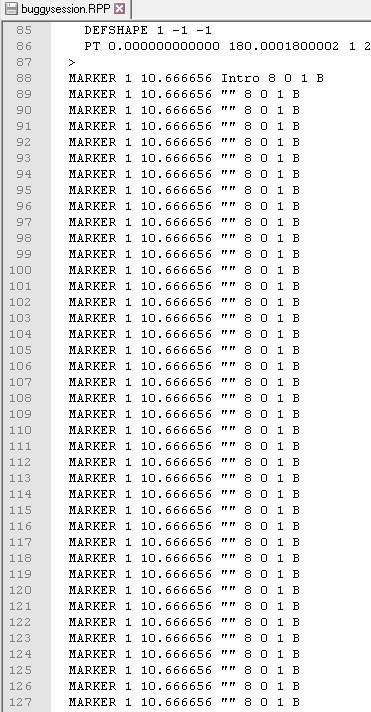 I have replicated this bug with an empty project and just one marker. The marker type 8 in your screenshot isn't valid. Reaper seems to notice it, think it is a region (which needs an ending marker which is missing), then tries to correct the situation by adding yet another marker to signify the end of a region. But type 1 is a region, not 8. So as you edit the project the marker keeps self replicating! To create a test project, just create an empty project, add one marker, then edit the RPP so the type of the marker is 8 (type is after the marker name field). 1)	Within the Marker Window, select a marker. It becomes highlighted a dark blue-ish. 2)	Click anywhere on the timeline. The marker is now highlighted a light grey/white, an important aspect of this issue. 3)	Create either a marker or a region. The previously selected marker is still highlighted a light color. 4)	Ctrl + z to undo. 6)	Click elsewhere in the timeline and create another marker. 7)	Ctrl + z to undo. 8)	More markers --- 4 markers. 10)	Ctrl + z to undo….. oh wait, you want to hear that edit again. Ctrl + Shift + z to redo. 11)	More markers --- 8 markers. Ah thanks, this should all be fixed in 5.974 (and in 5.974rc1 which is available via the pre-release forum).